24 x 48 in. Oil on stretched canvas by Hall Groat Sr. 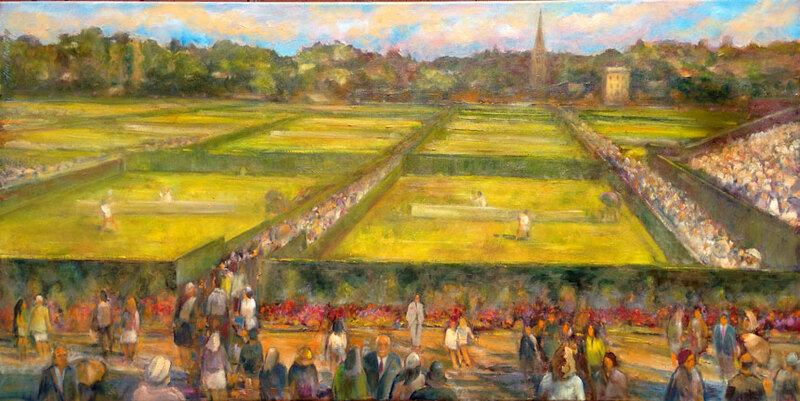 This original oil on gallery wrapped museum canvas is of Wimbledon. This masterful piece captures the energy and movement of the figures. It’s painted in rich red, blue, yellow, violet, gray and green tones. Dark green and purple are the traditional colors of the world`s oldest and most prestigious tennis championships. Since 1877 the All England Private Club has held the Ladies and Gentlemen`s finals late in June and winding up in early July. The club was founded in 1868 and first televised the championships in 1937. The rain seemed to arrive too often and delay the matches, much to the displeasure of fans —who suffered through those aggravating delays. After much debate, the club decided they must go ahead with the construction of a retractable roof and in 2009 the world could watch as the gigantic roof closed for rain and the show could continue without a hitch. As the world began to withdraw from traditional customs, many players kept trying to add their personal touches to the traditional all white tennis attire. The oldsters were gradually forced to give into progress—not only tennis but other sporting events as well. Private all men`s clubs like the Brooks`s, one of Prince Charles favorite dinning clubs also broke tradition allowing women to dine with men after five hundred years. Our British hosts, Dr. and Mrs. Allan Thomson invited my wife and I to dine with them at the Brooks`s. Some of the senior male members gave our group sour expressions of disapproval. Year after year, British tradition is being eroded by boorish European and American celebrities who dislike having to curtsy before the queen. I personally find British tradition very acceptable. The excitement builds well before the matches begin — as anxious fans from most every country in the world file into Wimbledon to see history prevail for another year of tennis brilliance. And if it rains, we can leave our umbrellas back at the hotel. I find it important to understand tradition and find my own way to introduce the human condition through my art. To portray the fabric of society and the spirit of the sport is still important and the only way I can stay in the game. Executing a large painting depicting the Wimbledon Championships is better portrayed by focusing on the fans and capturing their sense of excitement. I have kept the actual players at a distance, the way they will be perceived by the galleries. Even distant buildings and shrubbery can be seen. Rose bushes are depicted in the distance, as well as foreground — wrapped around the outer gates. The rolling clouds mimic the action of the event and are suggested in the distant horizon. Painting is a journey of a lifetime and tennis makes a great travel companion—so always bring your racquet on the trip.